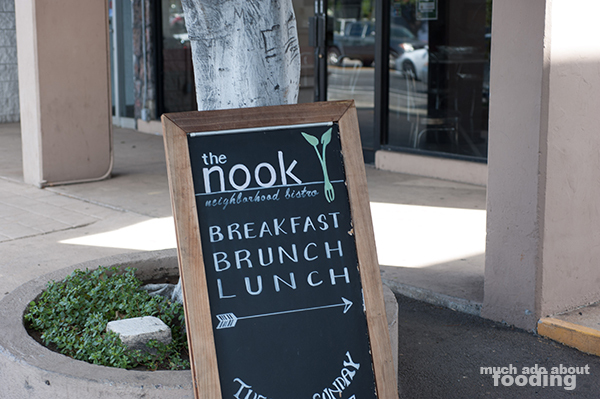 If the neighborhood is buzzing about a brunch spot, you better believe that we have to check it out. In this case, the neighborhood was not our own but knowing a few locals sure helped in spotting out a joint in Honolulu that had the nearby folks curious. 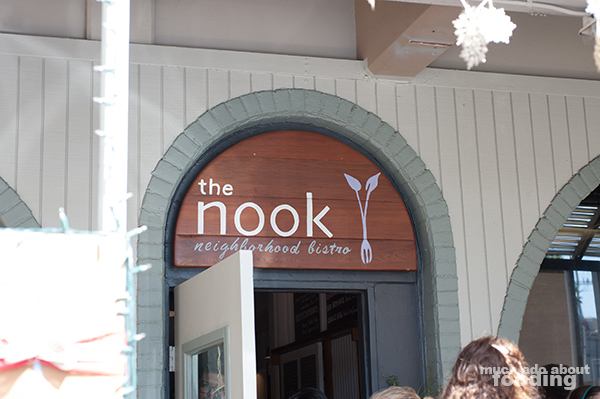 The nook apparently replaced another local favorite but has found its way into the hearts of others. Celebrating local and seasonal ingredients with a commitment to getting their eggs, milk, produce, and meat from Hawaiian farmers, this restaurant piqued our interest. When we arrived, there was already a long wait out the door but luckily, our friend's friends had already snagged a table early. Time to check out what made this brunch spot a coveted restaurant. 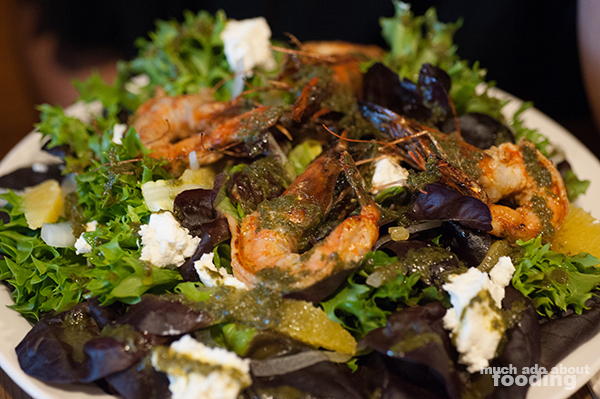 I settled on their Citrus Shrimp ($14 - spicy Kahuku Shrimp, Waipoli butter lettuce, orange, goat cheese, and mint vinaigrette) because though we were there for brunch, it was near to 2PM by that point. Something "lunch-y" sounded like adequate criterion for my selection. When they say citrus, they mean citrus. My mouth slightly watered again thinking about this salad. The dressing had a zip to it, and the shrimp were excitingly large. I enjoyed how the goat cheese worked to mellow out too much tang to the plate which was almost too much to handle. The shrimp were very meaty and though there weren't many of them, they did work to keep me full. There were several of us at the table that afternoon but dishes ordered were repeated based on the popularity heard by word of mouth. There are some dishes that supposedly stood out more than others. One of them was the Pork Belly Benedict ($14 - poached eggs, crispy pork belly, English muffin, hollandaise, and sides), a veritably hefty dish of what seemed like perhaps too much. Had I had this for breakfast alone, I would have been passed out all day from overeating. 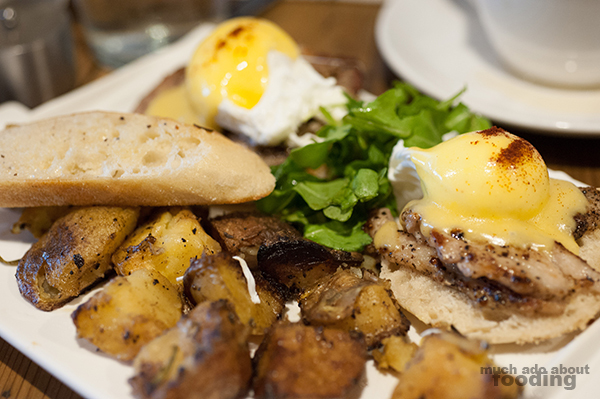 The poached eggs were rounded and runny to perfection, and the pork belly glistened in its fat. I'd have to say that they weren't as crispy as they could have been but the crunch from the English muffins underneath made up for some of it. Potato hash for a side produced chunks not quite cooked all the way through but you could forego that for more of the eggs! 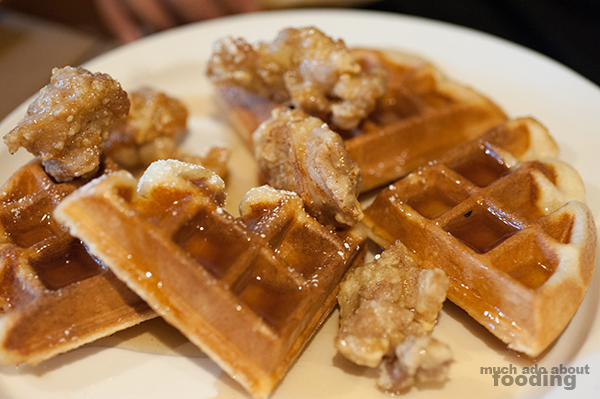 My favorite, however, of everything was the well-known Mochiko Chicken and Waffles ($13.50 - buttermilk waffles, mochiko chicken, and bacon maple syrup) which, upon first sight, did not seem impressive but once bitten into, showcased why they are raved about. The batter used on the chicken gave it a unique bite and texture between crunchy and chewy. I especially enjoyed the waffles which had the perfect airiness in each bite but enough moist batter to be dubbed waffles. The chicken pieces were small but moist, and the salty-sweet syrup gave a nice touch to it all. Overall, not a bad joint for a less-than-traditional brunch menu but make sure you head there early enough to get a seat. The lines never seemed to let up during our dining!